Kayaking – so much fun!! Facebook Group, come and join!! This place is very clean and quiet. Phone signal level = HAHAHA, no. There is also a bunkhouse for hire, a field for static caravans and also an area that accepts motor homes. No rubbish anywhere, and the bins were emptied daily. Overall, the campsite site is quiet and everyone is friendly and polite. 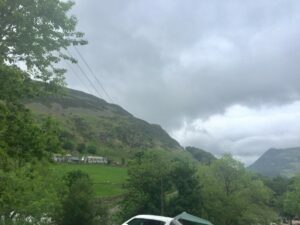 As we are all in the middle of the Lake District, everyone is out site seeing during the day and back in the evening to relax and enjoy the peaceful surroundings. This is a peaceful and relaxing site surrounded by hills/mountains, the sound of sheep and the running of the nearby stream. 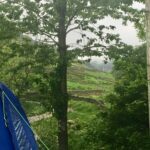 If you are camping, this campsite does not have electric hookups on its fields. This is reflected in the pricing on the website which does not show a camping price with electric. There are a few pitches right by side of the farmhouse that can have electricity provided to them. Basically this is an extension from the farmhouse and thrown over the wall for you to plug into. You can call and ask about them but having electricity at this site may restrict the availability. We booked early. There is no site shop, so if you need some supplies then just enjoy the leisurely 5 minute walk along the stream down to the villages shops. There are a couple of shops there, all with adequate supplies and camping essentials. We had to buy a sharp knife for cooking, as I always (man) like to forget at least one important thing every theme we camp. There is a catering van on site, but not open all the time (see below for details). This is run by a very friendly lady called Anne. The kids did partake in one of her lovely bacon/egg rolls on one occasion. Toilet and shower facilities on site although not very modern are spotlessly clean and more than adequate. Showers are 20p, they are nice and warm and last more than long enough. There is also a separate room for washing your cooking stuff too. Overall, this is a site for getting out and sightseeing. It isn’t filled with beautifully tended flower beds, play areas for the kids or fully serviced super pitches. 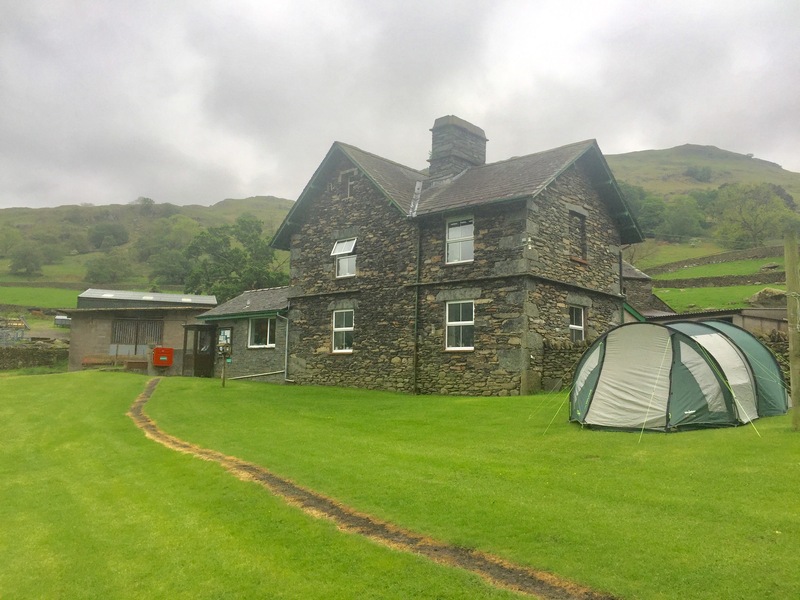 It is a clean and adequate campsite located in a stunning setting at the foot of Helvellyn. They have been catering for campers/hikers since the late 1950’s. What we got up to in the Lake District. We arrived Sunday to some very sunny weather. The site was easily signposted from main road. Greeted by a very friendly lady called Anne who came over to us as we pulled up. 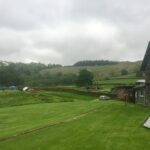 She told us they had sorted us a pitch out with some electric (anyone that needs electric has a pitch near the farmhouse and they run a round 3-pin extension to your tent for you to plug your mains unit into). There was a car in our pitch that should have already gone but they had gone off for a bike ride and could be back any time. 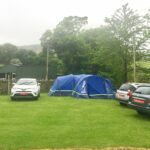 So we decided to lay out the ground sheet and start blowing up the air beams on the tent in the hope that the car owners would return soon and kindly relocate their vehicle. They did, and we all grabbed a corner of the ground sheet and easily relocated the tent into a better position (advantages of an air beam tent). Then we proceeded to set out the guy ropes and put everything else into the tent. It was at this point we realised that I had forgotten two essential pieces of cooking equipment, the air fryer and the George foreman grille. I say essential and to you they may seem a little luxurious but when you have 6 people to feed and all the ingredients you brought with you were dependant on that equipment, it becomes a slight problem. However we did have a twin gas stove (I didn’t forget the gas), a petroleum fuel burner (I didn’t forget the fuel) and some sunflower oil. Thanks to my wife we all ended up eating deep fried home made chips with and chicken breast burger topped with bacon and cheese. We were all happy and the youngest even learned how to peel potatoes using a knife without loosening any fingers. After tea we went for a walk to the Travellers Rest pub for a swift Guinness. Later back at the tent we found ourselves all playing one of the kids card games called Dobble. It was very entertaining to play as a group, we had a right laugh and it is highly recommended. I woke up the next morning to the sound of light rain on the tent and popped down to the loo, taking the opportunity to enjoy the mist rolling down the mountain tops. 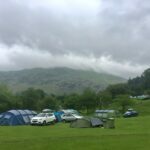 I took a few photos of the mountains (and mist/clouds) and the camping area. It might not have been sunny at the time, but it is very difficult to dampen the beauty of the place. The kids had a bacon/egg roll for breakfast, served by Anne who opens up her catering van at weekends. The van is situated down by the stream. Mrs TentLife tried the showers, she said they were nice and warm and lasted a good 5 minutes. They take 20p. We visited Penrith (25-30 minute drive from Gillside) and purchased a halogen oven for £25 from B&M bargains. As stated, I had forgotten the cooking equipment and this seemed like the best replacement. We were right (see review). On our return to the campsite we did a short walk along Red Tarn Beck (stream that runs alongside the campsite) to the disused mine and back. 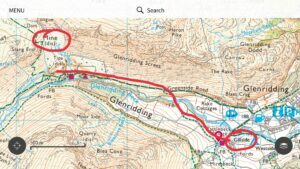 This was half way to Red Tarn (Helvellyn) which is the walk we would be doing on Wednesday. We had burgers for tea cooked in the halogen cooker. They cooked quite fast, also healthy as the excess fat dripped out away from the food. We’ve done a separate review of the success of the halogen oven on camping trips. This is a farm, and we were reminded of this when we woke to sheep outside our tent, just wondering around minding their own business and chewing on the grass. We had a drive down to village as we needed to pick up a kitchen knife and some cooking oil. There are a couple of useful shops, one with camping gear and other useful bits. Breakfast consisted of sausage and omelette on bread rolls, ready for our walk to Aira Force water falls. The sausages were again cooked healthily in the halogen cooker, and they didn’t take long to cook at all. We went to Aira Force (article coming soon), which is a short drive along Ullswater on the A592. 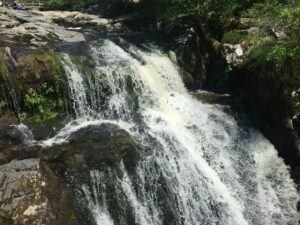 Aira Force is on National Trust land and is a beautiful waterfall situated in idyllic surroundings. I highly recommend a visit here and would certainly go there again. Drove to Grassmere but it was raining heavily so we changed our plans and went to Ambleside instead. 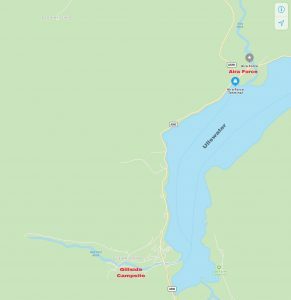 Ambleside is full of camping and hiking stores, most with big sales on so ideal if you’ve forgotten anything – Blacks, Trespass, Mountain Warehouse etc. Tea was chicken curry using chicken breasts and pataks jars. Warmed the nann breads in the halogen heater. Used the halogen cooker for a whole chicken ready for sandwiches for tomorrow’s walk up to Helvellyn. It got a bit chilly in the tent in the evening so we made use of the halogen heater whilst we had a cheeky bottle of the local ale. It warmed us up nicely and also allowed us to dry out some of our walking gear (the heater not the ale). Our breakfast consisted of pancakes with bacon and maple syrup. The pancake mix for this meal was pre-made at home, bagged and stored in our camping fridge/freezer. Today the family did our walk to Helvellyn and Red Tarn. 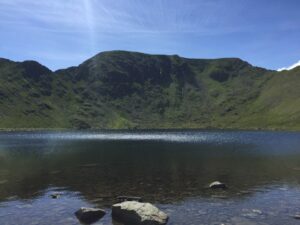 Red Tarn is the lake at the foot of Helvellyn (article coming soon) – our walk from the campsite and back was about 10 kilometres. We had made some sandwiches back at the tent and ate them at the side of the Lake, we also had some energy bars with us. The weather was really warm and we were glad for the hydration backpacks we had purchased for everyone (see review). We were all able to keep our fluids and energy up in the heat as we (2 adults and 3 kids) were out walking for about 5 hours in total. The view of Red Tarn with Helvellyn in the background was amazing. We sat and ate our food and the girls had a paddle in the rather cold water. We took a different route back down which was was very steep and not suitable for everyone. I will add the route to this article when I get chance. That evening we walked down to the shops, purchased some local ales. We had pasta/sauce for tea with bacon and chicken. Cereal for breakfast. We had cold milk stored in our fridge, but you can also pop to the farmhouse where they will gladly sell you a carton. Today we were off to visit local town of Keswick and the Derwent Water. We had parked in Keswick town (you might have trouble finding a parking space when this place is busy, so be patient), had a walk round and then we all grabbed an ice cream. From here, we went for a walk down to Derwent Water, past the Theatre by the Lake. This is where the National Trust Lakeside shop is situated. There are some large useful maps on the outside of the building for if you want to explore the area further. At this point we decided we would head back to the car and drive along Derwent Water, stopping off at a few spots along the the way. We walked back into Keswick, grabbed a pasty for lunch and jumped back in the car. 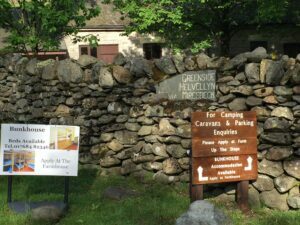 We drove a few minutes along the side of Derwent (B5289, Borrowdale Road) to the Great Wood carpark. We crossed over the road and sat on some rocks to eat our pasties (photo). 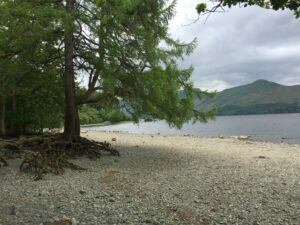 This little place is called Calfclose Bay, and you can sit on the side of Derwent Water and chill for a while (ad eat pasties). We then moved a little further along the same road to visit ‘Suprise View’ (photos). Turn off the main road at the National Trust signs (Ashness Bridge/Ashness Farm). You can either drive up to Surprise View or walk from bottom car park (takes about 30 minutes). We decided to drive up as there is a carpark nearl. The view is stunning and well worth it. 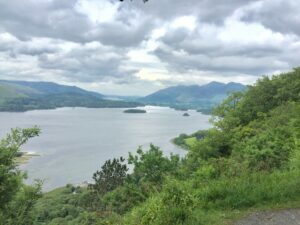 You are able to look out onto Derwent Water with Bassenthwaite Lake just beyond. 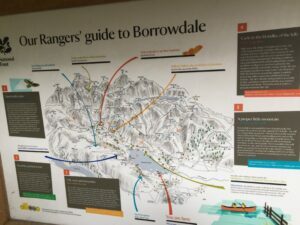 There are plenty of other beautify National Trust places to see in this area (Borrowdale), and if you are a National Trust member all the parking is free. We stopped off at Booths supermarket on the way back and grabbed some chicken burgers, a quiche and some fries for tea. All cooked in our new best friend the halogen cooker. As we are only here until Friday (tomorrow), we decided to dismantle the kitchen equipment and take down the tent awning/porch. This makes packing away on the last day a lot easier. We just moved the kettle and the fridge into the main tent area ready for that essential cup of caffeine in the morning. 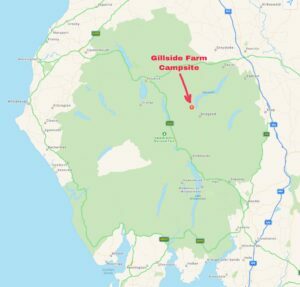 That’s about it form Gillside and this part of the Lake District. Tired? A little, but only because of the great adventures we had. Would we recommend the site? 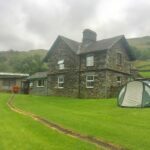 Yes, it’s basic but a perfect location as a base for adventuring around this part of the Lake District.